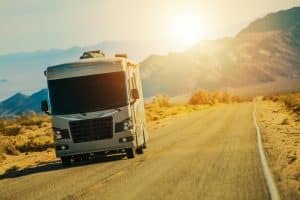 If you want a fifth-wheel with the handy garage space that comes with a toy hauler, then you’re in luck because there are some fantastic models out there for you. If you’re just getting into RVing and can’t stand to give up your motorized toys, then these models are perfect for you, too. In my humble opinion, fifth-wheel toy haulers are the best RV you can buy. The reason? You get to bring your motorcycle, dirtbike, golf cart, or ATV along with you. Most people who choose them have to make compromises and leave their toys behind. Not the case if you have one of these RVs. Here are five of the best fifth-wheel toy haulers on the market today. We’ll start things off with what is perhaps the best option out there: the Keystone Montana High Country. With the floorplan in the Montana High Country 381TH, you get the living space up front, a large kitchen area, a dinette on a slide out, residential size refrigerator and a spacious garage area for your toys. The quality of the materials in the RV will be top notch. Montana High Country models don’t cheap out, and the quality is well-known in the industry. You have seating for plenty of people in the living room area with hide-a-beds. There’s also a queen bed in the garage area that lifts out of the way so you can pull in a golf cart, ATV, motorcycle, etc. The 381TH can sleep up to eight people. We have a video of this model if you want to learn more. Another great offering from Keystone is the Raptor 425TS. This model has the master bedroom up front and it provides a big king mattress. There are two bathrooms (one full) in this model and a large L-shaped kitchen. The living space is smack in the middle of the floorplan, and the two recliners on the slide out next to the refrigerator can be swapped out for a dinette should you please. There’s another bed over the garage space and the large 12-foot garage should offer plenty of space for whatever you want to bring along with you. I especially like this floorplan because it makes a lot of sense. The living and eating space is right in the middle and there’s plenty of room for multiple people and plenty of spots to sit and sleep. This model sleeps up to nine people. While I would recommend the two Keystone models first, the Heartland Fuel 352 is also an excellent option. It features a lovely floorplan with a spacious kitchen area, a full bathroom, a half bath, and a master bedroom up near the front of the RV. While this floorplan lacks the spacious living room area in the two models above, it offers a 13-foot garage space. There’s also a queen bed above the garage space. The model comes with three slide outs that really opens up the space, and the layout of the floorplan makes it work well for multiple people. 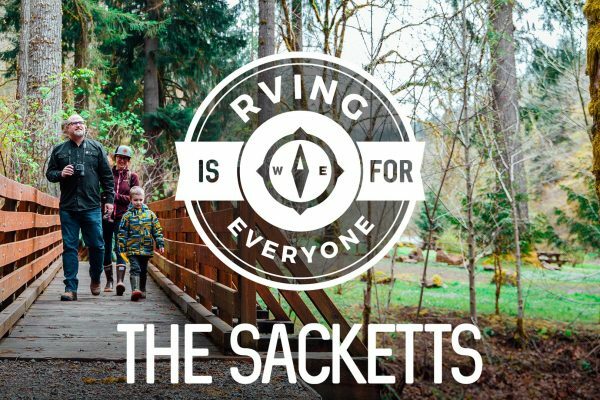 This means it’s great for bringing along the entire family or some friends. 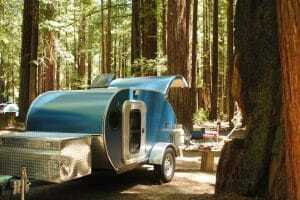 It sleeps up to eight people. For more information check out our video review. The Jayco Talon 413T offers a lot of fantastic features and has one of my favorite layouts of any RV. I like that the master bedroom is at the front of the unit and it’s set apart from the rest of the RV. The model comes with one full bathroom and a half bath, a fantastic kitchen and living space that’s right in the middle of the floorplan. The garage area is a full 13 feet long and offers the ability to transport an ATV, golf car, or motorcycle easily. When it’s not full with your toys, it can be used as additional living space with a cargo table and seating. There is a queen bed back there too and a loft storage area. This model sleeps eight people, so its great for large families or a group of friends. Another fantastic offering from Heartland is the Cyclone 4115. This floorplan offers a massive 15-foot and one-inch garage that will definitely be big enough for whatever you want to store inside. Above the garage is a queen bed and the model, like many others on this list comes with two bathrooms—a full and a half bath. The model comes with two slides for additional space and a large bedroom at the front of the camper with a king bed. I like the way this one is laid out because you have a traffic path that runs all the way through the model. It’s easy to get from one end to the other and the amenities are smartly placed. Also, you’re not going to find a garage space much bigger than this. The amenities are plentiful, too, and the model sleeps up to eight people. What do you think of these models? What would you want in a fifth-wheel toy hauler? Leave a comment below. You claim these to be the 5 best, but how are they ranked for insulation values and 4 season use?? I haven’t found a good four season unit until I got my Northwood AF. I wanted a toy hauler but I use mine year-round so need to just haul my toys by other means. Keystone’s Montana has a long list of four-season features. Not sure what you’re looking for in terms of features, but my guess is that what’s offered would satisfy. Did you consider the Grand Design 376TH?